A. He’s a Sherlockian. B. He’s very very shy. Because of A I’ve met him twice, at annual Baker Street Irregulars banquets. Because of B we’ve never exchanged more than a hello. But last night at the cocktail party before this year’s BSI banquet I was introduced to his manager, who asked what I wrote. When I told her about Lydia Chin she said, “Kareem has a Chinese protagonist in his new Mycroft book — you have to tell him about your series!” She took me to where he was sitting in the corner and started to introduce me, and the first miracle occurred: Kareem said, “Oh, yes, I’ve already met SJ. How are you?” Then instead of fainting I told him I understood his new book was partially set in China. 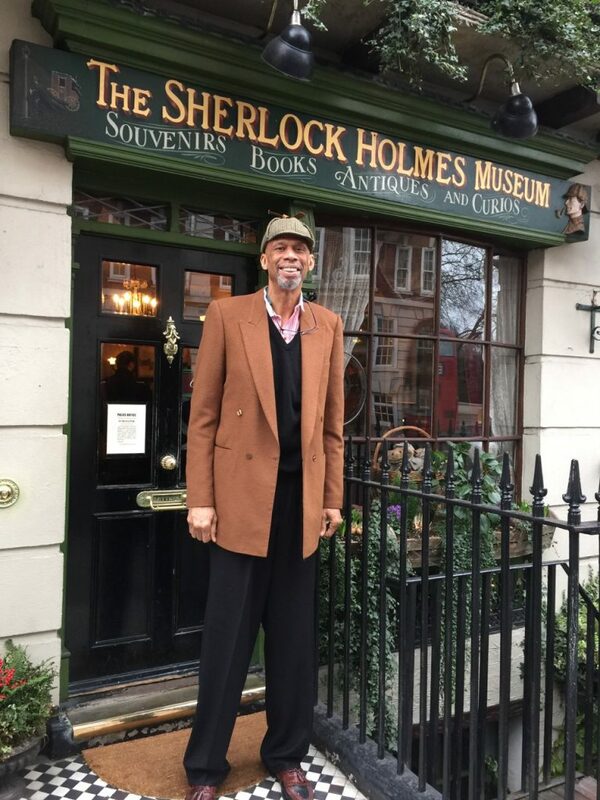 He said yes, Mycroft Holmes in his work for the Foreign Office had to go off to the East… And the next thing I know, I’m standing there at a cocktail party discussing the Boxer Rebellion with Kareem Abdul Jabbar! Wow. What a treat it would be to meet him. I didn’t know he was a writer. I did know, however, he played hoops back in the day 😉 and learned Karate from Bruce Lee. Earl — the guy is amazing. He was more engaged talking about China in the 1890’s than I’ve ever seen him talking about basketball. I am BEYOND thrilled for you–and around back to thrilled, again, ET! Susan — I was so knocked out I was jealous of MYSELF! Bob Carruthers — Well played, sir! I would have loved to see a picture of you two together. You probably would have made him look tall. Wonderful story, photo, setting. Love it.